We were privileged to witness two of the New Zealand Tall Blacks finest shooting guards exhibit their skills over a four-hour period last Wednesday night. Corey Webster scored a career high 35 points (14/26FG) against the Cairns Taipans at Vector Arena. This was followed a couple of hours later by 24 points from Kirk Penney (8/15FG) as he helped the Illawarra Hawks ease past the Crocodiles 96-88 up in Townsville. Later in the week we got to see a couple of NBL sideshows – Leon v Dion followed by Penney v Kenny. On Friday in Sydney it was Leon Henry v Dion Prewster as the Townsville Crocodiles visited the Sydney Kings in a bottom of the table clash. Prewster, entrusted for the first time with a starting role, was the one to come away with winning grin as the Kings eked out a hard fought win, 87-78. Prewster only managed 4 points but thrived on the defensive responsibility given to him by coach Damian Cotter as he secured 7 rebounds and constantly harassed key Crocs guards Jordair Jett and Clint Steindl. Henry had a solid game for the Crocs scoring 10 points and adding 5 rebounds. 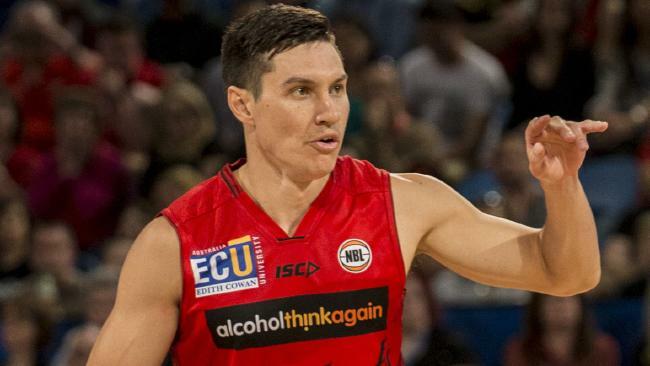 On Saturday night Jarrod Kenny got the better of his Tall Blacks colleague Kirk Penney as the Perth Wildcats overwhelmed the Illawarra Hawks 91-62, winning the second half 51-26. The last time Penney was in Perth, in 2011, he was in a Breakers singlet and knocked down 38 points against the Wildcats. On this occasion the ever improving Kenny shot the three ball at a better clip than his more illustrious opponent – 100% (2/2) v 33% (2/6). Penney still totaled a team high 19 points but overall it was a night to forget for the Hawks. Over in Europe Rob Loe put together an outstanding stats line as his Belgium club Limburg United continued their strong start to the season with a comfortable 86-66 win against Antwerp Giants. Loe was perfect from the field (7 from 7) as he led the United scoring with 16 points, the Tall Blacks centre added 5 rebounds, 4 assists, 2 steals and a block. In Spain CAI Zaragoza entertained SLUC Nancy in the Eurocup and improved their record to 2-1 with a narrow 78-76 victory. Zaragoza appeared to be heading for a comfortable win when they led 72-63 but had to withstand a late charge from their French opponents. Isaac Fotu scored 10 points and grabbed 4 rebounds. On Sunday Zaragoza entertained defending Spanish League champions Real Madrid. Unusually, in three of the four periods the scores were tied, the critical one that separated the teams was the third, won 24-16 by Real to help them secure an 88-80 win. Fotu played almost 30 minutes scoring 13 points (6/10FG) to go with 4 rebounds. Real improve to 3-1, Zaragoza slip to 1-3. The new Plymouth Raiders player coach Daryl Corletto is still waiting for his first win in the British Basketball League but the Raiders will have to shoot better than the 25% (17/68FG) they managed in front of their home crowd against Leicester Riders on Friday night before that is likely to materialise. Forward BJ Anthony was one of the guilty parties scoring with just 2 of 13 attempts as Plymouth went down 71-49, their lowest ever score in the BBL. Two days later Plymouth made the 500km trip north to Manchester to play the Giants only to find the Trafford Arena court was unplayable. The court had been treated with the wrong cleaning fluid making the surface slippery and unsafe. The game will be played later in the season. Steven Adams may not yet be a Tall Black but possibly the most recognisable face in New Zealand basketball warrants a mention. Adams came up with an athletic block in the closing seconds to help Oklahoma City Thunder to a 112-106 victory in their season opener against the San Antonio Spurs. Adams finished with 6pts (3/4FG), 7 rebounds an assist and that vital block. 48 hours later OKC visited Orlando and defeated the Magic 139-136 in double overtime. Russell Westbrook (48pts) and Kevin Durant (43pts) combined for a total of 91 points! Adams made another solid 9p/8r/2a/2st/2blocks contribution.